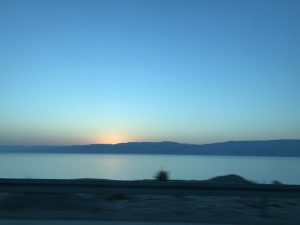 Here you’ll see a picture of Masada, and the sunrise over the Dead Sea along with a map to show you our route. 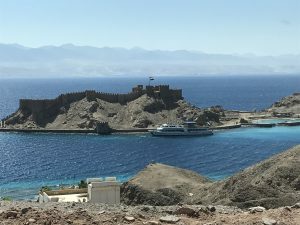 In the picture with the fortress in the Red Sea we could see 34 countries Israel, Egypt, Jordan and Saudi Arabia . 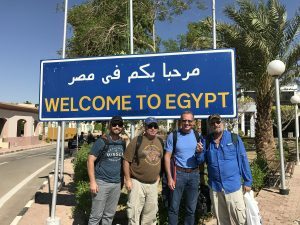 Also a picture of our crew in front of the “Welcome to Egypt” sign. 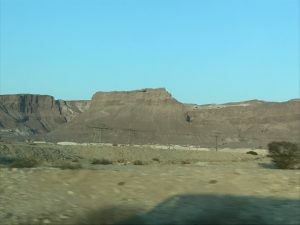 driving through Egypt we were stopped by security every few miles. They are on the lookout for ISIS and other radical groups. You’ll also see our crew with all of her camels laying on the ground resting just before we get to Sinai (ha ha). 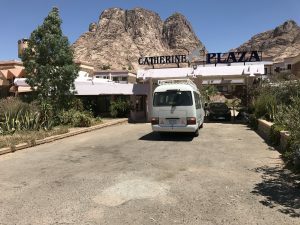 We arrived at Saint Catherine’s monastery and arrived at our hotel which is a one star hotel. There are only a few hotels way out here in the middle of nowhere and all of them are one star hotels. It is pretty rustic out here in the wilderness. My wife sat on the toilet and mosquitoes flew out from underneath. Last time we are here at Mount Sinai we woke up with mosquito bite welts all over her body. We brought some spray this time and hope it will help. She’s a saint! 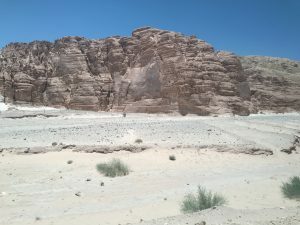 Tomorrow we leave at 4 AM on camels for the long trek to the top of Sinai. 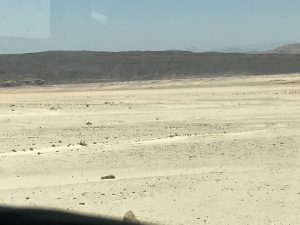 Camels take us 2/3 of the way and then we have to scramble up rocks the rest of the way. But we want to present the full and honest story of Elijah and Elisha. It’s a tough job but somebody’s got to do it :-) Read 1 Kings 19:8-15. Fathers can be gentle and warm but they can also be tough and severe at times. I remember every spanking I received from my father—and I always deserved it. His hand was so large and so was its impact upon me (no pun intended). It always redirected my behavior and brought about a commitment to avoid such punishment in the future. But because my father loved me and gave his time and affection to us kids I was able to accept the discipline of love upon my backside. I always had more respect for my father at that moment that at any other time. He loved me enough to be tough and demanding. He loved me enough to cause short-term pain to instill long-term character. Love should not be confused with simply being nice. Though love often includes being nice, “niceness” is certainly not a synonym of real love. Love is often tough and can initially be perceived as hard or insensitive. 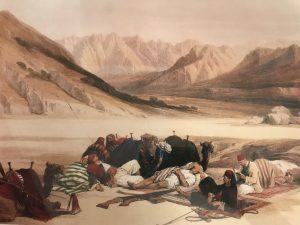 A new church in the far off land of Asia Minor, which is modern day Turkey, heard some of Paul’s harshest words and threat of discipline, and rightfully so, for he was their father in the faith. He speaks sternly to his children but he speaks even stronger to their enemies. He speaks with a righteous anger and exasperation to the Judaizers who intended to upset the applecart and ruin the souls of his children. Thus Paul stepped in as a protective loving father and he stepped in with both feet. But let’s set the stage first. Galatia was located in modern Turkey and Paul wrote to them between ad 48 and 54 (the exact location and date has been a matter of intense debate, outside the scope of the this article). Paul traveled north from Israel into this land and preached the gospel of grace to Jews and Gentiles alike. The Galatians received the word from Paul “as an angel of God” (Gal 4:14). But, after receiving the good news from Paul they began listening to others from Jerusalem who confused them with heresy. Heresy is an unpopular word today—politically incorrect—but it has been an essential word throughout the history of the Church. The word originally meant a “choice or self-willed opinion” and then was used to describe an unorthodox teaching, one that was wrong and damaging which usually ended up by causing a division. There were heretics who came to the Galatians saying Paul was wrong and only presented a partial truth. To understand the great frustrations and drama swirling around this vulnerable new church in Galatia, one must first understand a pinnacle chapter in the Acts of the Apostles(Acts 15). The issue was one of race and religion. It was one of divided societies and the requirement of the New Covenant to integrate previously separate societies. The Jew and Gentile had to become one in Christ. But how? Some of the Jewish converts said that to become a Christian the uncircumcised pagan had to first become a Jewish. They said “Unless you are circumcised according to the Mosaic practice, you cannot be saved”.